What is a Glomus Tumor? 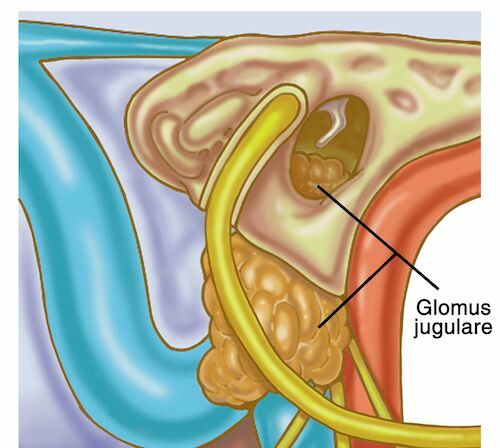 Glomus jugulare (also known as Jugulotympanic Paraganglioma) tumors are tumors from embryonic nerve tissue (embryonic neural crest), which normally form a part of the nervous system known as paragangliomas of the sympathetic nervous system. Glomus tumors are categorized as neuroendocrine neoplasms with its neuro-secreting granules of hormones, which rarely (less than 3%) produce enough hormones to affect blood pressure. These tumors are usually located along blood vessels in the head, neck, chest, and abdomen. The majority (97%) of these tumors are benign in contrast to the three percent with malignant behavior as manifested by distant metastases. 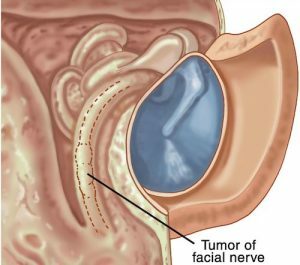 Paraganglioma tumors of the head and neck are classified by their anatomic location: carotid body (adjacent to the carotid artery in the neck), tympanic (middle ear), jugulare (middle ear/skull base), vagal (neck), laryngeal (voice box), nasal, and orbit (eye). The most common location in the head and neck is the carotid followed by the jugulotympanic (middle ear). Glomus tympanicum tumors are usually small, nourished by very small blood vessels in contrast to the larger glomus jugulare tumors, which involve the jugulare bulb and jugular vein in the upper neck. All these tumors are very vascular, sponge like filled with blood. Paragangliomas typically occur in the fourth or fifth decade, but can be seen in infancy and as late as the eighth decade. They present more frequently in women. Three to ten percent of the paragangliomas also occur simultaneously (multi-synchronous) in other parts of the body, with a higher incidence (25-35%) presenting in those with a hereditary predisposition. The genetic form of transmission is autosomal dominant, which can present in high as 50 % of offspring. Jugulotympanic Paragangliomas can appear with symptoms from affected structures of the ear: pulsatile ear noises (tinnitus in synchrony with the heart rate) due to increased blood circulation in the tumor adjacent to the inner ear, hearing loss, from tumor mass interfering with sound transmission or erosion of little bones of hearing or inner ear, ear pain, hoarseness and swallowing difficulties (dysphagia) due to weakness of nerves to vocal cords and the tongue. These symptoms vary with the tumor size and location relative to the above structures in the ear and skull base. visible to the examiner. The larger glomus jugulare is deeper in the skull base/middle ear where it is not visible in its initial stage of growth when it is small. After considerable growth, it can be frequently visualized in the middle ear. Your otologist-neurotologist physician will perform a complete otologic-head and neck examination, including cranial nerve assessment to determine if and which structures may be affected: hearing, facial movement, balance, facial sensitivity to touch, tongue movement, swallowing ability, and vocal cord movement. Your hearing test may include listening to the affected ear by an objective examiner for pulsatile ear noises. Evaluation of the vocal cords will be with fiberoptic laryngeal endoscopy with topical anesthesia (awake), performed in the office as part of a routine initial examination. Imaging studies such as CT scan, and MRI are used along with MRA (angiography of the blood vessels in the head and neck to determine tumor blood supply and extent of tumor). Management of Glomus jugulotympanicum tumors is usually with surgical resection in properly selected patients based upon their general health, age, and tumor size. Larger glomus tumors maybe preoperatively prepared with embolization to block blood supply to reduce operating time and blood loss. Interventional radiologists skilled in this extremely helpful technique perform embolization. If the tumor is very large and abuts on the adjacent carotid artery, which also supplies areas of the brain, further evaluation regarding collateral blood supply to the brain may be required. Surgical approaches to these tumors are varied mostly depending on the tumor size and affected adjacent structures. Preservation or return of function in impaired structures is individualized, depending on extent of tumor invasion of given structures and possible reconstructive options. These will be discussed thoroughly in your preoperative counseling sessions after appropriate information is collected to enable this discussion to take place. Elderly, fragile, medically unsuitable patients or those unwilling to undergo surgery may be treated with radiation or combination of limited surgery and radiation therapy. These options will also be reviewed in detail after appropriate information about your health and the tumor is obtained. If you have any questions about Glomus Tumor Surgery and treatment, please feel free to call Dr. Kohan’s office for an appointment (212) 472-1300.